News: 10/5/12 - All new members are REQUIRED to fill out the signature section of your profile. Otherwise, you may be deleted from the forum. This is to help me determine if you are a member or if you are a spammer. Thank you. 9/22/12 - I ask that you please add a signature line to your profiles on the Cletrac Forum to help me to determine who is spam and who is not. You don't need to drop everything and do this immediately, but please do it when you get a minute and you are visiting the forum. Just go to http://cletrac.org/forum2010/index.php?action=profile and put something in the signature area. 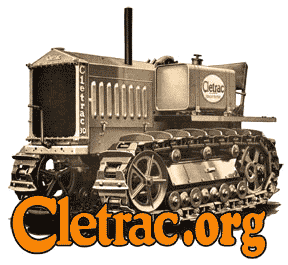 If you no longer want to be a member on the Cletrac Forum, please remove your membership. 5/30/11 - Just added several new pictures to the Photo Gallery, including several Alfta Track OC-4 working in snow logging, several from the Chicago Road Show, and some from a logging show (not all Oliver/Cletrac). All these pictures are from around 1963 and were scanned from old slides given to me by my late friend John W. Davis. Go to the Photo Gallery and click on "NEW" to see these pictures. Quality is marginal, but I think you will enjoy them. 2/13/11 - Just added a new board "New members introduce yourselves here". A picture is worth a thousand words...how about a few videos.